Small enough to install in very tight places. Strong enough to give a tight, lasting seal that won't shake loose. Applications: hose and tubing, fuel lines, air lines, fluid lines, etc. 5/16" band is 300 stainless. Housing and 1/4" hex head screw is made from a plated carbon steel. 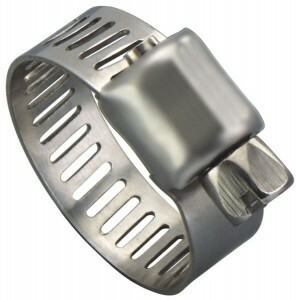 5/16" band & housing are made of a 300 series stainless steel. 1/4" hex head screw is made from a 400 series stainless. 5/16" band, housing & 1/4" hex head screw are made from 300 series stainless. Options:Available in partial stainless, all stainless and all 300 series stainless. Please see the table below for options.